As parents, we want to do whatever we can to prevent harm to our children. At the Cutting Hill Clinic, we offer all routine childhood vaccinations as well as those not available on the NHS, including Varicella (Chickenpox), Meningitis B, and Gardasil (HPV). All services are administered by our highly experienced Doctor. Also available – Private GP Services, Facial Aesthetic Services and Injections for Excessive Sweating. At Cutting Hill Clinic, we offer the chickenpox vaccination (varicella). 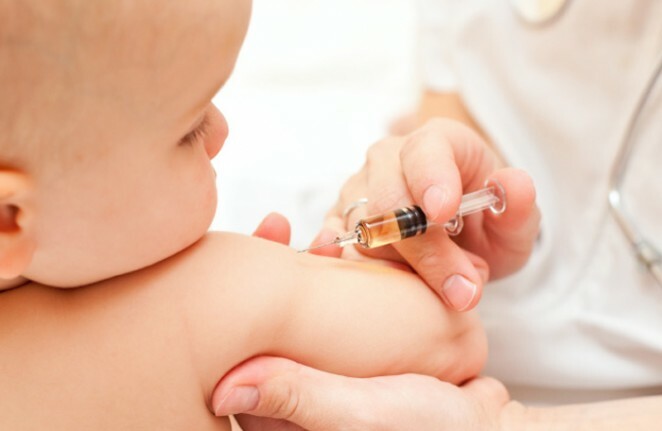 Although this vaccine is not currently routinely available as part of the NHS childhood vaccination schedule, it is part of the schedule in many other countries. Parents in the UK are increasingly asking for their children to be vaccinated. For now, this must be done privately rather than on the NHS. We do believe that children should be vaccinated against chickenpox and we hope this will eventually change. Chickenpox is a highly contagious infection caused by the varicella zoster virus. It typically causes a fever, and a rash consisting of itchy, inflamed pimples that soon turn into blisters which crust over to form scabs. It is not unknown for people to have up to 500 blisters or more over their entire body. In the UK, it most often affects children. It can be itchy and uncomfortable, can leave scars, and can sometimes cause severe disease. Adults may suffer more serious symptoms, including pneumonia. In people with reduced immunity, chickenpox can be fatal. In countries where chickenpox vaccine is given routinely (such as the US), protecting vulnerable populations with reduced immunity is considered to be a major reason for widespread use of the vaccine. Chickenpox is spread by inhaling droplets coughed up by people infected with the virus, or by physical contact with them before their blisters have crusted over. 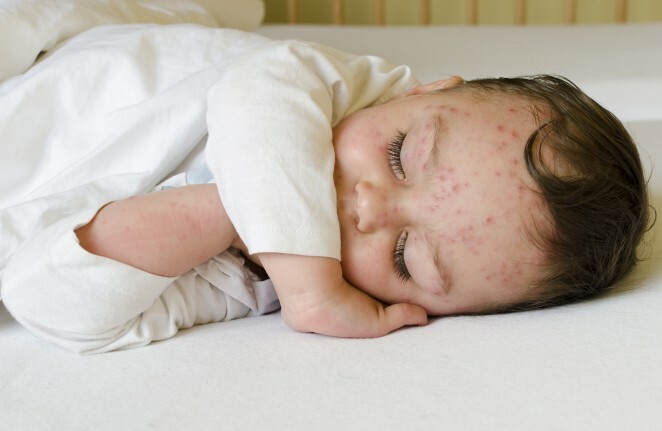 People with chickenpox become contagious about 2 days before the appearance of the rash, which can make it difficult to avoid becoming infected. The Chickenpox vaccine (varicella) contains live, weakened virus which stimulates immunity to varicella zoster virus and protects against chickenpox. If you have recently been exposed to a person with chickenpox, and have not had chickenpox in the past, it may be beneficial to be vaccinated without delay. Early vaccination may prevent the disease appearing, or may make it less serious. The vaccine will also protect you from future exposure to chickenpox. We are also able to perform a blood test to check your immunity (results available within 24 hours) – many people who are concerned about possible exposure, turn out to be immune. Who should not receive the Chickenpox vaccine? Chickenpox vaccines contain a live virus, and therefore should not be given to people who have reduced immunity (for instance, as a result of HIV, or cancer chemotherapy) or during pregnancy. If other live vaccines are also needed, they should either be administered on the same day, or with a gap of at least one-month between them, for optimal efficacy. We will be happy to discuss this with you in more detail when you come to the clinic. The chickenpox vaccine (varicella) can be administered from the age of twelve months onwards. Two doses of vaccine are necessary, normally with a 4 week gap between the doses. Appointments are usually about 15 minutes. What are the costs of the Chickenpox vaccine? The cost of the chickenpox vaccine is £82 per dose. We offer a private service for Meningitis B Vaccine (Bexsero). This vaccine is currently offered on the NHS to children who were born after May 1st 2015. If your child was born before this date they will not be offered it as part of their routine NHS immunisation schedule (though we hope that this may change in future). Meningitis B is a bacterial infection that most often affects children under one year old. Whilst the infection is treatable, it can be fatal in about 1 in 10 cases. What Does the Meningitis B Vaccine Do? Meningitis B vaccine protects against the majority of Meningitis B disease strains in the UK. Meningitis B vaccine represents a major technological breakthrough as for many years, it was widely believed that a vaccine against B strains of meningitis would be too difficult to produce. In infants and children, the most common reaction is a fever and some swelling around the injection site. Infant paracetamol is sometimes recommended for small children. How is the Meningitis B Vaccine Given? The Meningitis B vaccine is given in the form of an injection. 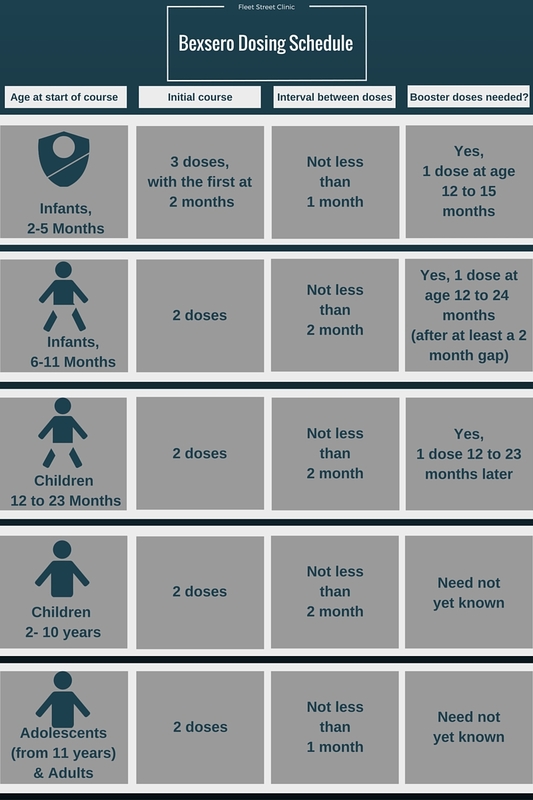 Children aged 2 to 10 years require 2 vaccine doses with at least a 2-month interval between the doses. Adults and Adolescents (from 11 years) require 2 vaccine doses with at least a 1-month interval between the doses. What is the Cost of the Meningitis B Vaccine? The Meningitis B vaccine costs £128 per dose.